When in 1566 the war against the king of Spain broke out, catholics and protestants were still united in their goal of greater autonomy. However, starting with the capture of Brielle by protestant pirates in 1572 and the torturing and murdering of 19 monks and priests in that town, the martyrs of Gorcum, the war more and more became a religious one. In 1579 the Union of Utrecht was signed, an alliance between the northern provinces. This treaty was supported by catholics, even though it ratified the prohibition of catholicism in Holland and Zeeland and guaranteed the catholic church a secondary position in the other provinces only. In 1580 count Rennenberg, the catholic stadtholder of Friesland, Groningen, Overijssel and Drenthe, disgusted by the cruelty of the protestants, returned to the Spanish side. This gave the protestants an excuse to outlaw catholicism wherever they seized power. Churches were handed over to the often small protestant minorities, while others were simply closed or given a profane use. Since catholics were excluded from important public functions, many rich catholics became protestants in order to keep their jobs and maintain their social status. Only few people became protestant for theological reasons. Other catholics fled to the south, to areas still in Spanish hands. Ultimately, a minority of mostly poor catholics managed to survive the oppression in the Republic. In the occupied territories in the south protestantism was almost completely rejected. Attempts to settle protestants in these territories also failed. The famous Dutch tolerance of this time meant little more than that nobody was persecuted for his faith as long as he did not openly exercise it. The catholic mass, processions and pilgrimages were forbidden, and anybody found guilty of active catholicism was prosecuted and had to deal with severe punishments. The northern provinces all managed to break free from Spain relatively early in the long war. For much of the time fighting was restricted to the southern provinces. When in 1648 the Peace-treaty of Munster was signed, about half of the total population of the Republic was still catholic. During the Twelve Years Siege (1609-1621) some churches could be repaired. The church of Waalwijk (NB), which was built right at the border of Holland (Republic) and Brabant (Spain), was rebuilt as a symbol of catholic status. Only the part on Brabant soil could be rebuilt though, as protestant Holland refused its cooperation. The church only remained catholic for a few more decades; in 1648 it was confiscated and turned over to the protestants, but the new owners did not finish te church either. In the Republic the catholics met in houses and barns, the so-called hidden churches. In some cases catholic noblemen opened the chapels of their castles for the believers. In cities like The Hague and Amsterdam foreign embassies and consulates opened their private churches for the local population. Priests from the south travelled through the land to preach and rebuild the decaying catholic faith. In the occupied part of Brabant catholics attended churches built for them just on the other side of the border. In 1672 the situation improved a bit, when troops of the French king Louis XIV and the bishop of Münster almost defeated the Republic in an attempt to increase their empires. In the territories the French and Germans managed to capture, churches were temporarily returned to the catholics. The province of Overijssel briefly rejoined the German empire. Although the foreign troops were driven out of the Republic in 1674, the Republican regents realized that loyalty among the catholics was in their own interest. Officially the ban on catholicism was not lifted, but in many places the catholics did get the possibility to buy the right to build churches, as long as they are not recognizable as such. Towers were forbidden, as were in many cases tiled roofs. Also the catholics were required to refrain from doing anything that might annoy the calvinists, which seemed almost impossible as the protestants decided to feel provoked by just about anything catholics could possibly do. 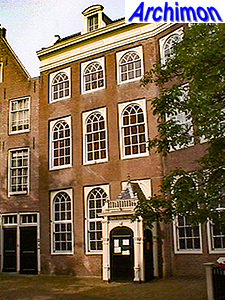 In Amsterdam one of the hidden churches was this building at the beguinage (picture left), the H.H. Johannes en Ursula, which was probably designed by Philips Vingboons. 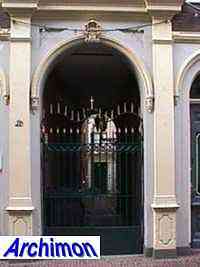 The catholics in Gorinchem built their church at some distance from the street, behind a gate (picture right). Members of the Old-Catholic church, the result of a conflict about the appointment of bishops in 1724, built similar churches. This denomination was especially strong in Utrecht and Haarlem. Policies could differ, however. In some conquered areas of the current province of Limburg catholicism wasn't banned at all. 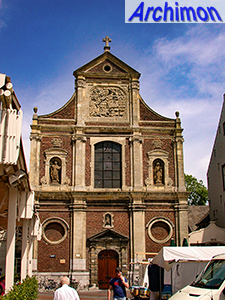 In Maastricht, where the Republic was forced to respect the rights of the prince-bishop of Liège, the four parish churches were equally divided between protestants and catholics. The picture shows the protestant St. Jan, with next to to it the St. Servaas, which wasn't a parish church and therefore remained in catholic hands anyway. In some places churches remained catholic, other churches were used simultaneously by protestants and catholics. Occassionally the catholics built new churches to accomodate the growing parish, which in some cases were even paid for by the government of Holland, the most powerful province in the Republic. The catholic response to the Reformation was the counter-reformation. Besides fighting its opponents, the catholic church finally tried to do something about the abuses in the church that had helped cause the rise of protestantism in the first place. Counter-reformation brought along a new style, Baroque, which in the Netherlands didn't get much of a chance. The current province of Limburg is an exception to this rule. 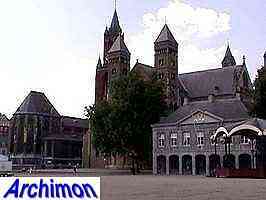 Much of this province remained under German or Spanish rule, which resulted in the construction of several Baroque churches, especially as part of a monastery, such as the St. Michiel in Sittard. 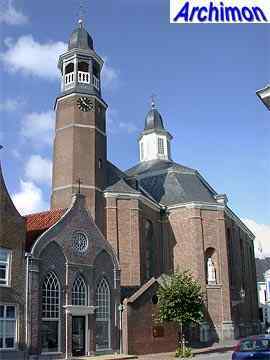 Other Baroque churches were built in Maastricht, Houthem and Eys. 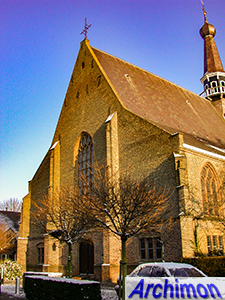 While the churches in Sittard and Maastricht represent the Southern Netherlands (read: 'Belgian') Baroque style, the churches in Houthem and Eys are examples of the more moderate German Baroque. Of all these, the church of Eys is the only one that was built for a parish instead of a monastery or convent. The only Baroque church outside Limburg is found in Ravenstein, the former capital of the Land van Ravenstein, which covered an area in the east of the current province of Noord-Brabant. After a period of protestant occupation it got a new catholic master 1630. In this area many religious orders founded new monasteries and convents, while churches and chapels attracted pilgrims from the Republic. In the town of Ravenstein in 1735 the Baroque parish church of St. Lucia was built. 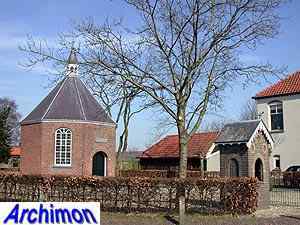 Because it was located in the free Land van Ravenstein, in the village of Deursen this small octagonal chapel, named H.H. Antonius en Rochuskapel could be built in 1745-1747. It attracted many pilgrims from outside the region. In 1794 revolutionary French troops invaded the Republic and the free enclaves. Although religious freedom was restored quickly, the autonomy of the enclaves was ended. A new state was founded, the Batavian Republic.